Nature provides us with art that is always changing in time and space. Delicate swirls and vortices give a rare glimpse of how the ocean’s surface looked today off eastern Greenland. The data originate from the MODIS/Terra satellite which from 440 miles above the earth captures light that is reflected from anything below. 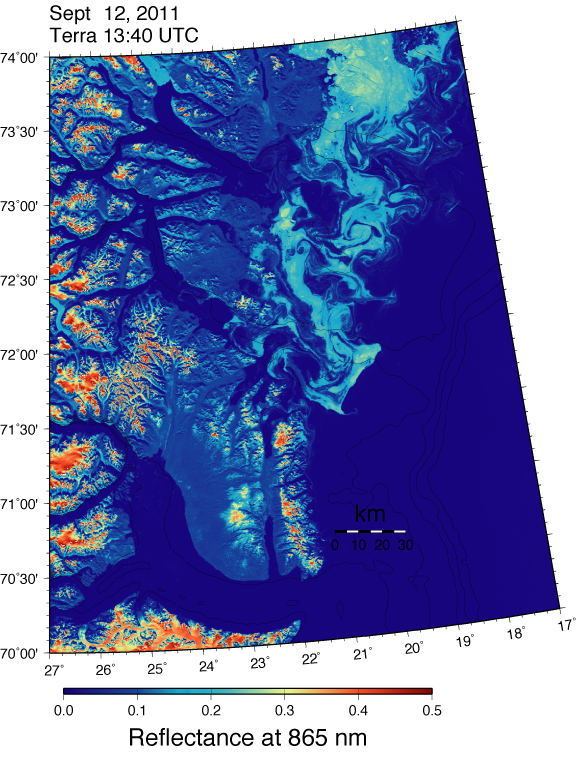 Here it shows the ice-free ocean (bottom right) and Greenland’s ice-free Scoresby Sound (bottom left) in very dark blues, lightly vegetated lands (left) in light blue, and a highly organized pattern of sea ice (top right) in white. The resolution of this image of light just beyond the visible, just beyond the red is about 300 yards and the swirls and elongated filaments are about 3-5 miles. To me, they vividly show the ocean’s surface circulation. Swirling surface motion on the continental shelf off eastern Greenland Sept.-12, 2011 as indicated by sea ice. Black lines show contours of bottom depth from 300 to 1200 meters in 300 meter increments. The physics of these motions are similar to those I was reading into another beautiful work of art to the north of Norway. The postulated physics involve the earth’s rotation as well as differences in density. The density of the ocean relates to its temperature a little and to its salinity a lot. Near the coast and at the surface, ocean waters are much fresher and thus lighter than they are offshore and at depth, because Greenland’s melting glaciers and sea ice are fresher than the waters of the Atlantic Ocean. The thin black lines show bottom depths to distinguish the deep Atlantic Ocean to the right in the image from the shallow continental shelf off eastern Greenland to the left in the image. Note that all the swirls, eddies, and filaments are within 30 kilometers (20 miles) off the coast in water less than 300-m deep. The same physics apply to the algal blooms off Norway which is the reason that the swirls and eddies are of similar size here and there as well. This entry was posted in Oceanography and tagged atlantic, coriolis, density, eddies, freshwater, glacier, Greenland, ice, ocean, shelves. Bookmark the permalink.